Monday 22 April to Saturday 29 June 2019 (10 weeks). If you book using the links on this page, you can buy a Term Pass for your chosen regular class and if you have an account, you will be registered for each class of the term. You can change your registrations for each class as usual, by signing in to your account. You can also book from the Timetable page and you will then need to register for each class individually. 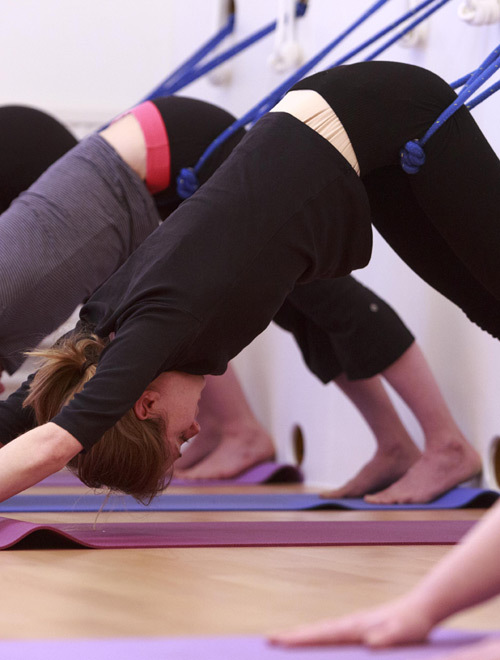 Learn the basics of Iyengar Yoga – 6 classes in 6 weeks for £50. This pass can be used at any Level 1 classes this term, but it expires 6 weeks after purchase. Only available to new students. Select your first class from the timetable and sign up and pay to buy your pass.. Choose the class you intend to come to each week (or mostly) from the list below and use the ‘book here’ link beside it to register for the whole term. The Spring Term Pass is valid until 29 June 2019. Any unused credits will be lost when the pass expires. Credits can be used at any class within the term. You can also transfer your credits to someone else before they expire (bring a friend with you to class). These classes suit beginners and those who want to focus on the Introductory level asanas. An excellent introduction to Iyengar Yoga – learn with other beginners. Please read our terms and conditions before booking and tell us about any medical conditions or injuries which may be relevant. This class is suitable for those with minor medical conditions and injuries, who need to practice at a slower pace. The class is slightly longer than Level 1 classes, to allow the teacher to provide more individual help and adjustments and for the use of more props. Please note, this term, there are only 9 of these Wednesday Gentle classes. If you buy the Term Pass, you will have 10 classes to use before the end of term, so you will have one extra class to use. These classes are suitable for beginners and those with more experience. Variations will be given where appropriate, to allow for different levels of experience in the class. Please note, this term, there are only 7 of the Saturday General classes (due to weekend workshops). If you buy a Term Pass, you will have 10 classes to use. You need at least a year’s experience of yoga to attend this class. You should be familiar with Salamba Sarvangasana (Shoulder stand) and able to hold it for about 3 minutes. Pranayama is introduced at this level. At this level, students should have a regular home practice and be confident in both Salamba Sarvangasana (shoulder stand) and Sirsasana (Headstand). Pranayama is taught regularly. Sign in or Register to book.